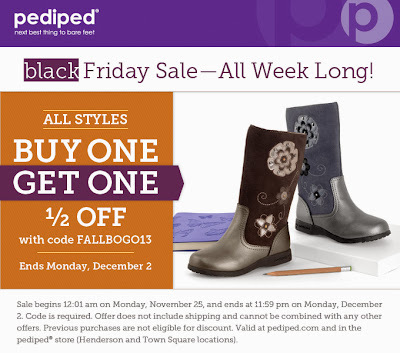 This is pediped’s one and only BOGO sale of the year where you buy one get one half off all styles November 25 –December 2. Use code FALLBOGO13 at checkout. About pediped®Exceptional quality, unsurpassed comfort and distinctive styling have made the award-winning company the fastest growing children's footwear brand in the United States. pediped® footwear has been awarded the American Podiatric Medical Association Seal of Acceptance for the promotion of healthy foot development, and preeminent orthopedic medical professionals, Dr. Mininder S. Kocher and Dr. Thomas W. Vorderer, deem pediped® shoes an excellent choice for parents/caregivers who want their children’s feet to develop naturally and healthily. In 2011 Earnshaw’s, the premier media resource serving the children’s market recognized pediped® with Earnshaw’s Earnie Award for Company of the Year and Best Footwear. In 2012, Earnshaw’s recognized pediped® for their philanthropy efforts of nearly $2 million, and pediped® was awarded the Earnie Award for Company for Good. pediped® footwear is sold in over 2,500 stores in the United States and 40 countries worldwide with an offering of more than 140 designs for boys and girls between their three lines, Originals®, Grip ‘n’ Go™ and Flex®. Originals®, Grip ‘n’ Go™ and Flex® are available in EU sizes ranging from 17 to 33. For more information, visit www.pediped.com.